It’s been fun, and in some ways odd, to be living a life similar to that of grad students at our age. (OK, make that grad students with maid service). One of the enjoyable things has been meeting the variety of people from all over, and of all ages. My present classmate is a lovely German girl of 21; Doug is studying with her friend, a 27-year-old cop from East Germany. We’ve also met plenty of folks in our general gerentological category — also a hoot. (Though I confess we’ve not always been well-behaved when we think they’re too uptight). But for better or worse, this is our last week of classes and we’re now going to take our word lists and endless conjugations on the road, head for the Caribbean coast, and unfurl our accomplishments on the world. We also understand on that side that a sort of Jamaican English is also common, mon, so it should be doubly amusing. But despite ourselves, I believe we’ve learned a lot, and though I would change some things for sure about the method of this school, I’ve found it basically good, serious, and the teachers very accomodating with interesting stories to tell. 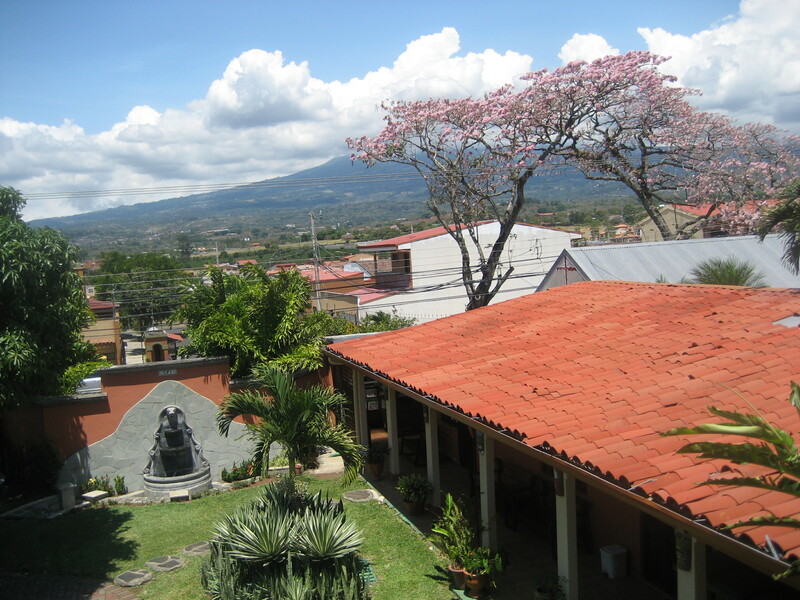 Like the other campuses, too, this one is lovely, with an outside rancho, for gathering and eating lunch, lush gardens, and airy classrooms. It is also awash with activities, trips for every possible taste offered on weekends, and many local excursions, too. Here we have availed ourselves of a wild dance lesson (three Latin dances in one lesson! 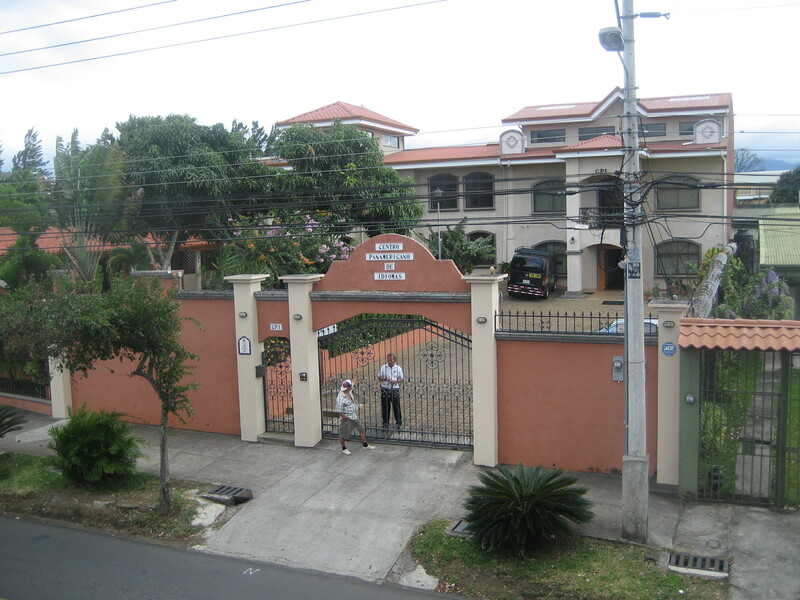 ), and two different trips to the larger city of Heredia. The first was a walking tour of the central part of the old city, whose most wonderful feature was a huge central market. The fruits and vegetables were gorgeous, and we also managed to pick up a variety of other useful items, from hand-made, corn-filled tamales to hand soap to bug spray. As for the rest, wandering around the crowded, often crumbling streets, and seeing the “famous” white-washed church and ajacent cultural center, it was a reminder that people don’t visit Costa Rica for the cities. The second visit, at night, reinforced that idea in spades. After a trip through residential neighborhoods varying from huge, and of course fenced-in, houses, apartments, and condos, to others made of tin shanties with open sewers running through them, very reminiscent of parts of Ghana when I lived there long ago, we suddenly pulled into a huge parking lot. And there it was, a shopping mall that could have been at home in N. Virginia or S. California. It not only had a cineplex, but a food court…complete with Taco Bell. We did have a great evening, though, seeing “Invictus” with Spanish subtitles, and highly recommend it. Open sewers? Yikes. And I thought potty training was messy. But the view from the school is lovely.